Wednesday: The London Literature Festival continues at the Southbank Centre: the book club reads Leila Aboulela's Minaret (6.30pm, free), in the run-up to the Olympics Iain Sinclair looks at how other grand projects turned out (hint - he's not a fan; 7.30pm, £14 / £10), while Keston Sutherland and Tim Atkins discuss Ezra Pound (8pm, free). G.K. Chesterton is up for discussion at the Idler Academy (7pm, £20). YARNfest organisers bring you a night to celebrate the Special Relationship, with Tom Basden, Josie Long, Jarred McGinnis, Sam Taradash, Ryan Van Winkle and Jonny Woo (7.30pm, £5). Thursday: Big night at the London Literature Festival. Ali Smith shares her thoughts on Tracey Emin (7.45pm, £10); Alan Hollinghurst launches his new book The Stranger's Child (7.30pm, £14 / £10); Ben Okri and Sarah Ladipo Manyika discuss African writing (7.45pm, £8); there's music and spoken word from Xiaolu Guo, Matt Scott and Steve Spark (7.45pm, £8); and Poetry London looks back at the Festival of Britain (8pm, free). 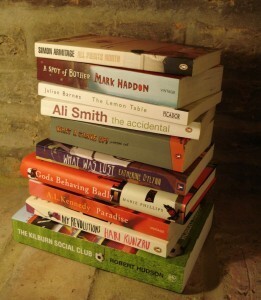 A Tale of Three Cities present their second book swap at Mannero's Bar on Kingsland Road (9pm, free, bring a book). Niall O'Sullivan presents Cath Drake, Alex Gwyther, bleue granada and Farhad Mirza as they premiere new work at The Albany for Apples and Snakes (8pm, £8 / £5). Tom Hodgkinson launches his new book Brave Old World, about country living, at the Idler Academy (7pm, £20). Lucreta La Pierre launches his new poetry collection, Meh Landing Frock, at Catford Library (6pm, free). Stella Duffy talks about her new historical novel 'Theodora - Actress, Empress, Whore' at Gay's The Word (7pm, free). Dream Catcher 24 launches at Pages of Hackney (7pm, £3), with Marilyn Donovan, Chris Hardy, Alan Dunnett, Steve Allen, Mike Lyon, Patrick Drysdale and Paul Sutherland. Hannah Read-Baldrey and Christine Leech celebrate the launch of Everything Alice with a Mad Hatter's tea party at Review Bookshop in Peckham (7.30pm, free). John Citizen hosts Tall Lighthouse at the Poetry Cafe, with Ruth Wiggins, Ken Champion, Maggie Sullivan and Chris Gutkind (8pm, £6 / £5). Friday: Part of Oxfam's Bookfest, Re:Versed comes off NTS radio and into Dalston Oxfam with Charlie Dark, Sophie Cameron, Angry Sam and Sabrina Mahfouz (4.30pm, free). Carlos Moore is celebrated at the London Literature Festival with the man himself, John Akomfrah and Margaret Busby (7.45pm, £10). Also: Nii Ayikwei Parkes introduces Choman Hardi, Seni Seneviratne and Reza Mohammadi (1pm, free), Jane Harris talks about her new novel Gillespie and I (7pm, £8) and Elif Shafak reads and chats about her work (7.45pm, £8). Saturday: At Coram's Fields and The Brunswick is the Pop Up Festival for children and young people: storytelling from Vayu Naidu, meet a Moomin, Bruce Ingman, Catherine Johnson hosts storywriting sessions in an 18th century tavern, Rastamouse creators Michael De Souza and Genevieve Webster, Tales of Peter Rabbit, Poetry Society performances, SLAMbassador Catherine Labiran, Louise Hill, Naga and Jamal Msebele, Francesca Beard, Chris Preddie and Aisling Fahey, Vanessa Kisuule, Gruffalo illustrator Axel Scheffler and Adisa - artists often appear more than once, check the programme for details. At the London Literature Festival, poets Joelle Taylor, Karen McCarthy Woolf, Philip Wells and Yemisi Blake take part in a workshop around the new Lion and Unicorn installation (10am, free) and poems produced in the Lion and Unicorn project performed at 1.15pm (free); Simon Armitage and Yemisi Blake introduce a film made by Dunraven School pupils (1pm, free); Colin Grant and Linton Kwesi Johnson discuss The Wailers (7.45pm, £10); Leila Aboulela reads from her latest novel (1pm, £8); International Prize for Arabic Fiction joint winners Mohammed Achaari and Raja Alem appear together for the first time (4pm, £8); Silver Story:SLAM looks at the Festival of Britain (5pm, free); and Aatish Taseer reads from and talks about his work (7.45pm, £8). Mista Gee, Raymond Antrobus, Simon Mole, Deanna Rodger, Kim-Leng Hills, Joshua Idehen, Hollie McNish and Bohdan Piasecki invite you to take a chill pill at the Albany (7.30pm, £5). Joy Howard launches Refurbishment at the Poetry Cafe, plus reading from Ann Alexander (7.30pm). Magma host a poetry afternoon at the Waterloo Festival - Clare Pollard leads a poetry workshop (2pm, £15) and David Harsent reads poetry about war (4pm, £5). New Zealand writers Kirsty Gunn, Paula Morris, Mia Farlane, Fleur Adcock, Robert Sullivan and Briar Wood read at Birkbeck (9.30am). Sunday: Catch the Trinity Laban Conservatoire of Music and Dance giving a new performance at the London Literature Festival, using the poetry of Coleridge, Blake and TS Eliot (1pm, 2.30pm, 4pm, free); Omar Barghouti, Seni Seneviratne and Carol Gould debate cultural boycotts (7pm, £10); Victor Gregg and Rick Stroud talk about World War Two from the point of view of the author and soldier (1pm, £8); Tahmima Anam and Mirza Waheed discuss fiction as a response to conflict (4pm, £8); writers shortlisted for the Caine Prize read from and discuss their work (7pm, £8). Back at the Pop Up Festival, there are illustration, magic and puppetry workshops, Geraldine McCaughrean, Philip Ardagh, Michael Rosen, Valerie Bloom, Joelle Taylor, Julia Eccleshare and James Mayhew - again, check the programme to see who's on when. Dean Atta, Francesca Beard, Ronnie McGrath and Lennox Brown join Jumoke Fashola for Jazz Verse Jukebox (8pm, £7). Monday: China Miéville, Sebastian Peake, John Sessions and Brian Sibley are at the British Library to consider Gormenghast (7.30pm, £7.50 / £5). The Book Stops Here returns to the Alley Cat with readings from Naomi Wood, David Whitehouse, Sophie Hardach and Shireen Jilla (8pm, free). At the London Literature Festival Alexandra Harris examines the Romantic Moderns (7pm, £8), Helen Oyeyemi reads from her new novel Mr Fox (7.45pm, £8) and Sahar El Mougy and Youssef Rakha describe what it was like being in Egypt during the recent uprising (7.45pm, £8). Alex Bell hosts Monday Musing plus open mic slots at the Poetry Cafe (7.30pm). Coffee House Poetry celebrate the end of their season with a star-themed evening (8pm, £7 / £6). Tuesday: China Miéville heads to Pages of Hackney to talk about his latest book Embassytown (7pm, £3). Toby Litt, Kim Newman, Pat Cadigan and Paul McAuley - plus filmed contributions from Margaret Atwood - discuss their favourite science fiction works, at the British Library (6.30pm, £7.50 / £5). Niall O'Sullivan hosts the regular open mic night Poetry Unplugged at the Poetry Cafe (7.30pm, £4 / £3). Zaha Hadid discusses her work (7.30pm, £14 / £10) at the London Literature Festival, while Jocelyn Bell Burnell talks about her extraordinary scientific career (7.45pm, £10). Ruth O'Callaghan hosts the Lumen Poetry Series, with Claire Booker, Martin Domleo, Lynne Foote, Angela Inglis and Caroline Vero (7pm, £5 / £4). Maria Jastrzebska's drama Dementia Diaries, based on her poetry collection Everyday Angels, plays at the Rosemary Branch Theatre from today until Thursday (7.30pm, £12 / £10). Paul Buck, Nat Raha and Nicholas R Scott are the poets at Blue Bus (7.30pm, £5 / £3).